The Archbishop Iakovos Library and Learning Resource Center opened in September of 1998 and was dedicated in September 1999. 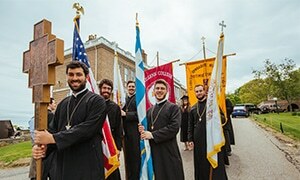 It is located on the campus of Hellenic College Holy Cross Greek Orthodox School of Theology. The facility serves the school and the greater academic and religious community by supporting the curricula of the undergraduate college and the master’s level theological seminary programs and by offering research materials for scholarly work. The Library’s resources are housed in the newer building and the remodeled older Cotsidas-Tonna Library. Its specialized collection includes acquisitions in Orthodox theology, Byzantine history, and Modern Greek studies. New publications are acquired on a regular basis. The Library houses over 64,000 monographic volumes, over 320 active print serial titles, a large number of audio-visual materials and various electronic databases. In addition, the holdings of the Library include a rare book collection in Orthodox, Greek, and general religious studies, as well as an archive of materials related to the history of the school and the Greek Orthodox Archdiocese of America. The third floor houses the permanent exhibition of the Archbishop Iakovos Collection. We welcome you to the Library of Hellenic College Holy Cross, and we encourage you to make use of the resources, materials, and services that are housed here. Your questions regarding the use and layout of the Library may be answered below, but if you have any other questions or research needs please speak with a member of the Library staff. If you are unable to locate the items you need, please speak with a member of the Library staff. When you are in the Library we ask that you respect the needs of others by refraining from loud talking and excessive noise. For the benefit of all patrons, please confine your social visits to the Reading Room in the remodeled Cotsidas-Tonna Library. All of the floors in the main building are reserved as quiet study areas. The only exceptions to this rule are the group study rooms (see below). Smoking, eating, and drinking are not allowed in the Library. If you enter with food or drink or are found with it, you will be asked to dispose of it properly. Cell phones are to be turned off. The Library’s computers are for research, academic and institutional use. Hellenic College/Holy Cross users have priority. Those individuals observed using the computers for inappropriate behavior will be asked to leave the Library, and if they are affiliated with Hellenic College Holy Cross, they will be reported to Administration. Every user of the Library must show all books at the Circulation Desk upon leaving the Library. The Library staff reserves the right to inspect all briefcases, bags, or other carrying cases. Please do not reshelve books. The Library staff will take care of this for you. Please leave books on the study tables or carrels or place them on the book trucks provided on each floor. An elevator has been installed in the main building for use by the Library staff and patrons who have special needs. If you or someone else needs assistance, please speak with a member of the Library staff or a student assistant at the Circulation Desk. We ask that you observe these rules and those listed below. Any violations of the rules and policies of the Library may result in a revocation of your library privileges. Thank you for your cooperation. A very important feature of the Library facility is the upgrade of the online system. The cataloged holdings of the Library are available via the Sirsi Dynix-Enterprise System on public computer terminals located in the building. The online catalogue is also available online here. For help in using the system, please speak with a member of the Library staff or consult the online tutorial for the Catalog Guide posted on the Library’s webpage. Faculty, staff, and students may check-out books from the Library if they have a valid school ID. Books can only be renewed with a current ID card. If you do not have your ID card with you, you may leave your books at the Circulation Desk and retrieve your card. No one is allowed to use another person’s ID card to check out books. Books are circulated to students for a period of 28 days. Books may be renewed (either online or at the Circulation Desk) unless a hold has been placed on the item by another patron. Again, books can only be renewed with a current ID card. Books may not be renewed over the telephone. Overdues and Fines: Overdue notices will be sent. Patrons are allowed two overdue books before borrowing privileges are suspended. New books may not be borrowed until all overdue books have been returned. Books must be returned to the Circulation Desk at the Library. At the end of each semester, all books are due on the last day of finals. The names of students who have not returned books at this time will be sent to the school administration. This may cause a delay in receiving final grades and registering for the following semester. Fines for overdues, damages to materials, and losses must be paid by the end of the semester. Overdue books are charged at the rate of $ .25 per day, per book. Books may not be borrowed if you owe $10 or more in fines. For a lost book the minimum charge is the cost of replacement and a $20 processing fee. While the Library primarily serves the needs of the faculty, staff, and students of Hellenic College Holy Cross, it is also available for use by the larger community. If you are a visitor from another institution, an area parish, or a visitor to the Boston area and the school, you are welcome to make use of the Library. Please assist us by introducing yourself to a member of the library staff and by filling out a Visitor Registration Form available at the Circulation Desk. As a visitor you are not allowed to check-out library materials without special arrangements .If you have any questions regarding this, please speak with the Director of the Library. Boston College Department of Theology, Boston College School of Theology & Ministry, Boston University School of Theology, Gordon-Conwell Theological Seminary, Hartford Seminary, Harvard Divinity School, Hebrew College and Saint John’s Seminary. Books may either be returned to our Library in person, or they may be returned via the library at another BTI institution. If you are not a student of a BTI affiliated institution, you are welcome to use the Library, but you are not allowed to check out materials. If you need to borrow materials please contact the Interlibrary Loan Dept. of your school and make a request. After our Library receives the proper form, the request will be processed and the book sent, barring any restrictions. Our affiliation with the BTI affords students and faculty of Holy Cross Greek Orthodox School of Theology the opportunity to utilize the collections of the libraries, either in person, or by the BTI courier who picks up and drops off books to each member library at the request of a patron. If you should need these services, please contact our inter-library loan librarian. You will be contacted when the book(s) arrives. Students and faculty borrowing materials from BTI libraries are subject to the conditions of each member library. Hellenic College Holy Cross will enforce the regulations of all BTI libraries. Each semester faculty will place materials for use in their courses on reserve in the Library. Reserve books and materials are kept behind the Circulation Desk. These items are limited to a two (2) hour check out and are for use only in the Library. Books and materials may be renewed if no other patron needs an item. You are not allowed to go behind the Circulation Desk and retrieve reserve materials. If you need an item, please speak with the staff member or student assistant at the Circulation Desk. You must provide a valid ID. These items will be clipped to the reserve book flag and kept at the Circulation Desk while you are using the item. Interlibrary Loan services are available to the students, faculty, and staff of our school. Occasionally, you may need materials located in other libraries. Please contact our interlibrary loan librarian or fill out an Interlibrary Loan Request Form via the OCLC FirtstSearch database. Please provide as much information as possible in order to assist the Library staff in processing your request. You will be notified when the material arrives or in the event that an item could not be located or is restricted. The equipment of the Library is provided to assist you in your use of the Library’s collection. We ask that you familiarize yourself with the proper use of the equipment. If you need assistance, please speak with a member of the Library staff or a student assistant. Do not attempt to make repairs or adjustments to the equipment. Computer Terminals and Printers: Computer terminals are located through -out the Library. The terminals provide you with a direct link to the Library catalog, as well as the Internet and other services. Each terminal is linked to a printer to facilitate making print-outs of selected listings or information. Audio-Visual Equipment: Audio-Visual equipment is located throughout the Library. The first floor AV Room is the location of a microfilm/ microfiche reader/printer and a copy stand for camera attachment. The AV Room on the Periodicals Wing contains a TV/VCR, DVD, and listening equipment. The use of this equipment is monitored by the Library staff and student assistants. AV materials may be checked out at the Circulation Desk and are for Library use only. Copy Machines/Scanners: The Library has two copy machines/scanners located on the first and second floors. The machines are for use by both patrons and Library staff. Currently, the charge per printed copy is $.10 for black & white and $.25 for color. You may use cash or change. The photocopiers have the capability to scan materials to email or a USB drive. If you experience difficulties in using the copiers or paper is needed, please speak with a member of the Library staff or a student assistant. The Library facility, including the remodeled portion, has many distinct areas. Please familiarize yourself with the facilities by using the description below and the maps that follow. Also, note the functions of each area and any restrictions that may apply. The classifications of the holdings on each floor read from left to right. Ground Floor – The ground floor of the building houses the General Collection (A-BJ, C-Z), the General Collection Oversize, and the Card Catalog. The ground floor of the remodeled Cotsidas-Tonna Library includes a lecture room, faculty offices, and Library storage areas. The Library storage areas are for staff only. Please do not enter these areas unless accompanied by a member of the Library staff. First Floor – The first floor of the building houses the Reference Collection, the Reference Collection Oversize, the AV Storage Room, the Microform Station, Technical Services, the Director’s Office, the Administrative Assistant’s Desk, the Circulation Desk, and the Rare Book Room. Also located on this floor are public terminals, a printer, and a copy machine/scanner. The first floor of the remodeled Cotsidas-Tonna Library houses a large Reading Room, Public Restrooms, and the Special Collections/Archives of the Library. Entrance and Exit – The main entrance to the Library is on the first floor in the main lobby of the new building. This is the only entrance and exit to the Library. To enter the building, please use the entrances to the main lobby or the handicapped entrance to the lower lobby. Circulation Desk – The Circulation Desk is where you request assistance. The desk will be staffed at all times. Patrons are not allowed behind the Circulation Desk. Reference Collection – The collection is ordered from left to right following the Library of Congress classification system. Please note the oversize and folio sections. The reference table provides you with ready-reference materials. Staff Areas – The Director’s Office, the Administrative Assistant’s Desk, and Technical Services are staff areas only. Please do not enter these areas unless accompanied by a member of the Library staff. AV Room – The equipment housed in this room may be used with the assistance of the Library staff. Rare Book Room – This room houses the rare book and material collection of the Library. Patrons are not permitted to be in this room without being accompanied by a member of the Library staff. Rare books and materials are only available for use from 9am to 5pm weekdays. You may request to use rare books or materials, but rare items are not available for circulation. Many also have copying restrictions. This is necessary in order to properly preserve the materials. When you request rare items, you will be asked to leave a current ID and any briefcases or bags at the Circulation Desk. While using the material you will be asked to sit at the Reference table. Reading Room – This area is for studying, but it is not designated as a quiet study area. If you desire to visit with another patron please use this area. Special Collections/Archives – This area houses the various archival collections of the Library. It is a staff area only. Materials located in this area will be available to patrons as they are accessioned and finding aids are created. Inquiries concerning archives and special collections should be addressed to the Director. Restrictions may apply based on the type of material. Special Collections and Archived materials are only available for use from 9am to 5pm weekdays. Second Floor – This floor houses the Periodical Collection, the Theological Collection (BL-BZ), the Theological Collection Oversize, Study Rooms, the Educational Resource Room, another AV Room, and Public Restrooms. A copy machine/scanner and two computer terminals are also located on this floor. Periodical Collection – The Periodical Collection is divided into two sections. The Periodical Display wing houses current issues of journals, magazines, newsletters, and newspapers on display and A-EPISE (by title) of the bound collection. The remainder of the bound collection is housed in the main area of the floor beginning at the front of the building and reading left to right. Periodicals do not circulate. Not all titles are on display or in the stacks. If you are unable to locate a title or issue, please speak with a member of the Library staff. Theological Collection – The Theological Collection begins on row five and reads left to right following the Library of Congress classification system. Please note the oversize section. Study Rooms – The two study rooms on the second floor are for use by patrons for group studying. Food, drink, and smoking are not permitted in these rooms. To use one of these rooms, you must check out a key at the Circulation Desk. You will be asked to sign in and leave your ID. AV Room – This room houses listening equipment for use by patrons. Tapes, DVDs and CDs can be checked out at the Circulation Desk. Please ask if you need assistance using the equipment. Third Floor – This floor houses the Archbishop Iakovos Collection. Individuals and groups may visit the Collection weekdays, 9am-5pm, by appointment. Adjacent to the Archbishop Iakovos Collection is the Pomfret Alumni Conference Room. The use of the Conference Room must be approved by the Director of the Library and/or the Administration of the School.